When Chris Eubank Jnr. claimed the IBO Super-middleweight title by overwhelming the underwhelming defending champion Renold Quinlan a couple of weekends ago, it was all pretty super familiar. The next generation Eubank looked the part as he always has, save for the first half of his 2014 encounter with Billy Joe Saunders, showing flamboyance, movement, accuracy and incredible punch output but, more significantly, reiterated a seeming lack of world-class power. It is an intriguing cocktail too because Eubank Junior is eminently hittable as well, but like Senior looks to have durability in his toolkit along with the more offense orientated spikes and shimmers. Eubank releases punches in fantastical swarms. It is an offensive alchemy that looks lifted from Xbox gameplay and is an approach that has also confused and vanquished the likes of Dmitiri Chudinov, Spike O’Sullivan and tragically Nick Blackwell. If he was blessed with power too we would be looking at a terrifying prospect but he isn’t and we aren’t. Instead, and more realistically, we are looking at an exciting prospect tailor-made for the Instagram age but one who may just find that his mayhem of lightening bolts bounce off higher quality opponents, while the thunder bolts coming the other way don’t bounce off himself quite so easily. And that ‘maybe’ is intriguing. It will span the Middle and Super-middleweight divisions. It will antagonise and exasperate promoters. It will align and alienate the public. These two have met before of course. But Chris Eubank Jnr. has attempted to airbrush the defeat he experienced there from the ledgers. He calls it a fluke of luck. But it wasn’t. Saunders out boxed Junior for the first half of the fight with some schooled technical work, before Eubank fought his way back in and finished strongly, albeit too little too late. 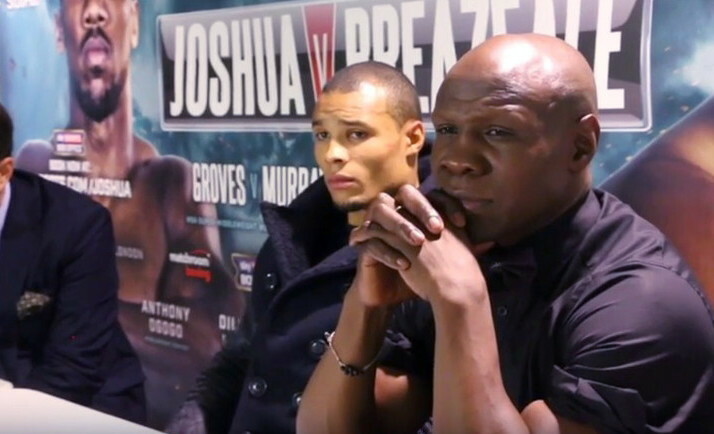 The question is, who has improved the most since and you have to say Eubank Jnr. has in easily winning six straight. Saunders whilst still undefeated in three has looked less impressive. Yes, he took the WBO Middleweight title against a shop worn Andy Lee but was actually lucky to scrape a decision victory last time out against Artur Akavov. Eubank Snr. Has suggested that a rematch would now be a mismatch, but a motivated Saunders against a retribution-hunting Eubank Jnr. makes this the fight to make. ITV Box Office take note. The recent evolution of DeGale has been an intriguing one that has seen him develop from Olympic, pretty-boy stylist to grizzled road warrior, picking up and defending the IBF world Super-middleweight title along the way. Eubank Snr. seems keen on DeGale next, suggesting that he is their ‘picked’ opponent. For DeGale this might well be a tempting home-coming that offers less risk and a lot more reward than his recent international travels. The icy Kazak enigma still has one or two questions of his own to answer in terms of opponents faced and ring crisis managed. Questions that may well be answered in his 18th March clash of the hard-hitters with Daniel Jacobs. A win there will surely confirm that Golovkin makes boxing look easy rather than boxing easy opponents. If he can hang with the skilled power of Jacobs and emerge victorious you have to feel that he would walk through Chris Eubank Jnr. James DeGale’s January draw with Badou Jack saw the latter vacate the WBC Super-middleweight title and move up to Light-heavyweight, leaving mandatory challenger Callum Smith likely to face Anthony Dirrell to contest the strap this spring. A win for Smith would open a number of doors with James DeGale behind most of them but with the Dirrell fight yet to be confirmed, manoeuvres and money could yet see the WBC look to the UK for an OMG showdown with Eubank Jnr. in one of the corners. Like Golovkin, George Groves has some serious business of his own to take care of, in the shape of an imminent fourth tilt at a version of a world title against Fedor Chudinov. Victory there would give Groves the WBA (super) Super-middleweight belt but then actually increases his chances of rematching James DeGale. Ironically, a defeat to Chudinov may place him in pole position to meet Eubank Junior if Team Next Generation continue their strategy of stealthily climbing up the rankings through lower risk matchups. A hand injury derailed the unbeaten Mexican for 12 months and forced him to relinquish the WBO Super-middleweight title he took against Arthur Abraham in April 2016. He returns to action in April 2017 against Max Bursak, where the expected victory will put him straight back into the mix. The chances of Eubank Jnr. meeting Ramirez now or soon are slim, as the risks are high and the rewards are low but if both keep on track then a future meeting is inevitable. You are here: Home / Boxing News / Will Chris Eubank Junior’s path to glory be corrupted by a lack of power?